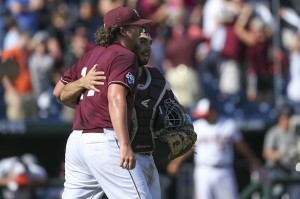 The Mississippi State Bulldogs beat the number three ranked Oregon State Beavers in Saturday’s opener and have now beat a hot-hitting Indiana Hoosiers team to move closer in their quest towards their first College World Series championship in school history. The Bulldogs struck first, as Adam Frazier led off the game with his school-record 105th hit of the season, a single to right field. Frazier would later come around to score on a fielder’s choice by Hunter Renfroe, giving the Bulldogs an early 1-0 lead. However, Indiana would strike in the second and third innings to jump ahead with a 3-1 lead. With two outs in the second, Casey Smith ripped an RBI single to center, scoring Michael Basil, tying the game at 1-1. In the third, nine batters would come to the plate in an inning that was highlighted by a Sam Travis RBI double to deep right center that would score Will Nolden, which would be followed by a Scott Donley groundout that scored Kyle Schwarber to cement a 3-1 lead for the Hoosiers. Indiana starter Will Coursen-Carr was solid for the Hoosiers, holding the Bulldogs offense to just two runs over 5 1/3 innings of work, before being pulled from the game after surrendering an RBI single to Wes Rea. Despite a quiet first seven innings, the Bulldogs would charge back in the top of the eighth. Brett Pirtle and Rea would lead off the inning with back-to-back singles, later coming around to score on RBI singles by Demarcus Henderson and Trey Porter (Henderson would also score on Porter’s single). The Bulldogs would send eight men to the plate and score three runs in all, taking a 5-3 lead over the Hoosiers. Despite scoring a run in the bottom of the ninth, the Bulldogs would strand Sam Travis and the tying run on third, losing to the Bulldogs 5-4. The star of the game for the Bulldogs was Chad Girodo, who worked 5 2/3 innings of relief, surrendering just one run and striking out an impressive 10 batters (the victory was Girodo’s ninth of the season, as he improved to a 9-1 record along with a 1.56 ERA on the season). With the victory, Mississippi State will face the winner of Wednesday’s game between Indiana and Oregon State on Friday, June 21, the game that will decide which team will advance to the best of three game championship series.